The Vauxhall Spurs have continued their winning ways over the past several games as they continue to rack up wins. The Medicine Hat Knights visited Jets Stadium for a one-game tilt on July 10 which saw the Spurs dominate most of the game. They would go on to win by 10 runs with a final of 16-6. On July 11, the Spurs travelled to Fort Macleod to battle the Royals in a doubleheader and emerged victorious in both games. The first of the doubleheader saw Vauxhall put up 13 runs while keeping the Royals to only six. 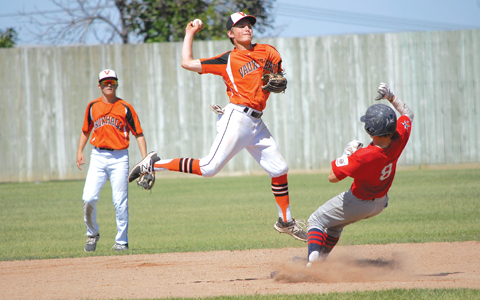 The second was a much closer tilt that saw Vauxhall edge out Fort Macleod 12-9. The Spurs were then back at home in Jets Stadium for a Friday doubleheader against the visiting Lewistown Redbirds. Both games saw the Spurs hit double digits again on the scoreboard. They took the first game with a score of 16-6 and the second finished with a 17-7 final. Riding high off of four wins heading into Montana on Sunday, the Spurs hit a speed bump in the first of the doubleheader on the road. After tallying a combined 74 runs in the prior four games, the Spurs only managed to plate one run in the opening game in Havre against the North Stars. They would end up losing 9-1. They rebounded nicely in the follow-up game though as they once again managed to cash in 16 runs in the game. The final score in the second game of the doubleheader was 16-4. Running the weekend record of 3-1, the Spurs pushed their record to 18-4 which is tops in the North A division in the American Legion. The Vauxhall Spurs will be back on the road this week with stops in Great Falls for a doubleheader on Thursday and Lewistown on Friday for another doubleheader. The Spurs will then wrap their regular season at home with one game against the Medicine Hat Knights. First pitch is at 2 p.m. at Jets Stadium. From there they head to Conrad, Montana for Districts where they hope to avenge last year’s disappointing early exit.